Mad Mics Organics LLC. 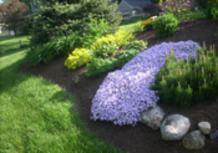 is proud to be known as a provider of green, Earth friendly, organic mulch. At Mad Mics Organics, we feel that we are doing our part to keep the planet safe and green by developing a recycled organic mulch product. Our organic mulch is available at an affordable price at our fine distributors and is perfect for anyone looking for a quality mulch that is eco-friendly. they do not consider that the chemically dyed mulch breaks down into the planting beds and the chemicals are released into the soil. Mad Mics Organic Mulch also breaks down in the planting beds. However, when it breaks down, it adds lab-tested positive nutrients to the soil. These nutrients ultimately enhance the plant and shrub growth while beautifying your gardens. We create our organic landscaping mulch from recycled horse bedding harvested from local farm owners. By finding a secondary use for ingredients that were once considered waste, Mad Mics Mulch is keeping our planet green in more ways than one! Please browse our website to learn more about our Earth friendly organic mulch and feel free to contact us if you have any questions.